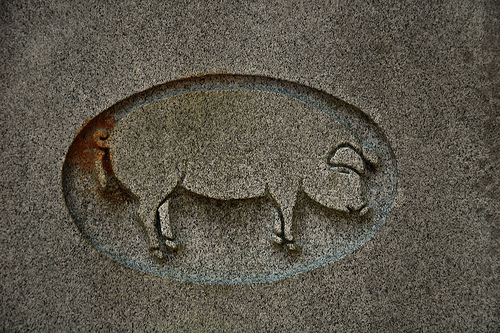 Bartow Barron Pig Monument (Detail). © Brian Brown 2012. One of the strangest but most heartwarming monuments you will see in Georgia! On this spot in 1933 during the Great Depression neighbors of a farmer named Bartow Barron joined together to rescue his pig from a dry well. This monument is erected to the spirit of friendship and community so characteristic of those times. Donors listed on the monument: Reynolds Allen, Beegee Baugh, John Burkey, Suzanne Caskey, Chris Chandler, Beaufort Cranford, Ruth Cranford, Nancy Culberson, Lee Dickens, May Donnelly, Charles W. Ennis, Noel Fowler, Floride Gardner, Emily Garner, Don Hartsfield, Myralyn Hartsfield, Goat Helton, Francis Ross Hicks, Cecil Hodges, Mary Holt, Martha Johnson, Maxa Osterman, Brenda Phillips, Rubye C. Pittman, Wesley Pittman, Randolph Puckett, Gus Pursley, Leon Thigpen, Catherine Everett Thurston, Elizabeth Tinley, and Harriett Wright. I tip my hat to these people for memorializing such a simple yet profound act of community! I’m not sure when the monument was erected, but I would guess the mid-1990s. I believe a poem about this incident was published by Harold A. Martin in his book Southland and Other Poems of the South (Cherokee Publishing, 1992), which is referenced at the bottom of the marker. I would love to know more. 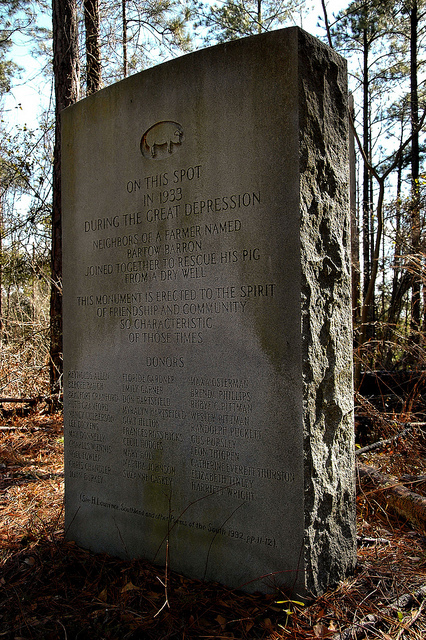 Bartow Barron Pig Monument. © Brian Brown 2012.